Every REALTOR® must adhere to a strict code of ethics, which is based on professionalism and protection of the public. As a client, you can expect honest and ethical treatment in all transaction-related matters. The first obligation is to you, the client. Buying or selling a home usually requires dozens of forms, reports, disclosures, and other technical documents. A knowledgeable expert will help you prepare the best deal, and avoid delays or costly mistakes. Also, there's a lot of jargon involved, so you want to work with a professional who can speak the language. A REALTOR® can provide local information on utilities, zoning, schools, and more. They also have objective information about each property. A REALTOR® can use that data to help you determine if the property has what you need. By understanding both your needs and search area, they can also point out neighborhoods you don't know much about but that might suit your needs better than you'd thought. Most people buy only a few homes in their lifetime, usually with quite a few years in between each purchase. Even if you've done it before, laws and regulations change. 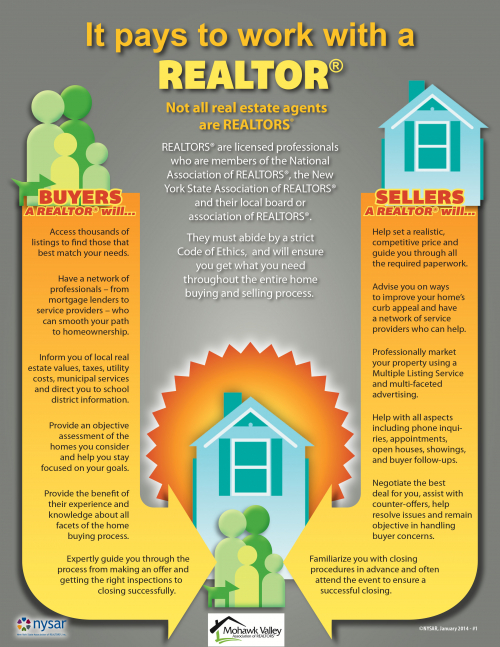 REALTORS® handle hundreds of transactions over the course of their career. A home is so much more than four walls and a roof. And for most people, property represents the biggest purchase they'll ever make. Having a concerned, but objective, third party helps you stay focused on the issues most important to you.